When you backed out of a driveway and did not even see how I swerved around behind your car to avoid T-boning you, how dare you have the temerity to tell me you were careful! I was 7 feet tall, dressed in bright yellow and traveling at no more than 10 km/h. Perhaps a simple lesson in physics will help you and your fellow “driveway backers” to realise how dangerous you are and to adopt safer driving practices. 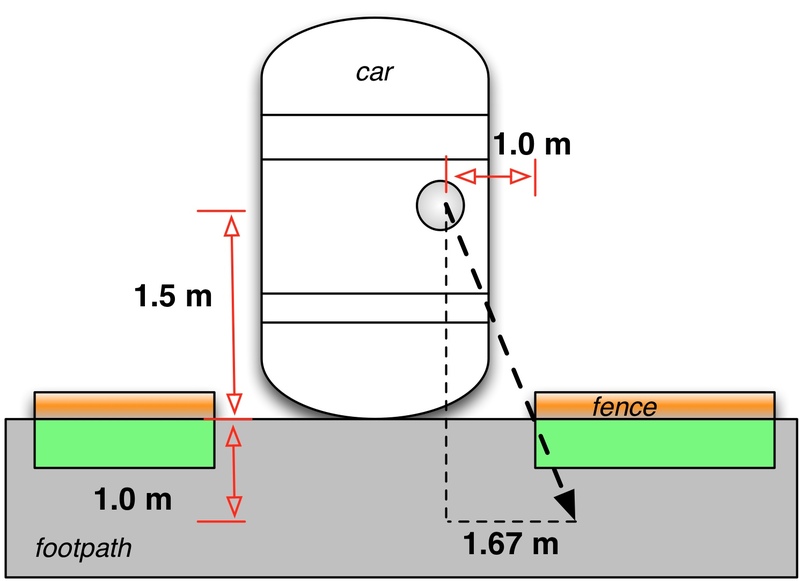 In the diagram you can see a car backing out of a driveway. Typically when you are at the edge of your property and have a fence (see photo below) blocking your view of the footpath you are able to see about 1.7 metres along the footpath. Let us imagine that there is a child on a trike riding at 5 km/h just out of your line of sight. How long does it take them to travel that 1.67 metres? The physics is quite easy. Car backing out of a driveway. Illustration of how little of the footpath can be observed. Velocity = distance/time, therefore time = distance/Velocity. 5 km/h is 5000 metres in 60 x 60 seconds, ie about 1.4 m/s. Putting this in the formula above means that it takes about 1.2 seconds for the child to travel that 1.67 metres. Now consider this. According to design guidelines for safe bicycle use 2.5 seconds must be allowed for someone to observe the danger, react, apply brakes and stop. In other words, if you covered the distance from your driveway to the middle of the footpath, about 1 metre, in under 1.2 seconds you will almost certainly hit the child. That is a speed of just 3 km/h!!!!! Postie on a bike 5-10 km/h. For those going 10 km/h your speed needs to be just over 1.5 km/h to hit someone! Never back out of a driveway unless you really really must. If you think you must because of the design of your driveway, change the design! Cut back those hedges, remove some of that fence so that you can see further. Always always always stop at the end of your driveway (BEFORE THE FOOTPATH) and toot a horn. Then proceed very very slowly. A driver entering or exiting a driveway must give way to a road user on a footpath, cycle path, or shared path (as described by clause 11.1A(1)). Thank you for considering the physics of maiming a child, may you never find your self in such a terrible situation. Excellent piece, John – thank you! I understand and agree with the gist of this post. However, ‘Changing the design of our driveway’ is not really an option for a lot of people, probably primarily because of money but also because of sharing driveways with other neighbours and taking into account their needs/desires too. Not to mention space. We used to go forward down our driveway until our neighbour had a flip-out at us one evening when she was tired, since we used ‘her side of the building’ as a 3-point turning bay and she said she didn’t want to live in a carpark so now we have to go down backwards. And tooting at the end of the driveway… can you imagine if everyone tooted at the bottom of their driveway before leaving? Ack. PS. Thanks for the road rule excerpt – the exiting is obvious but I actually wasn’t really aware that it also covered entering. Forgive me for picking on a personal aspect of this, but a loose thought about tooting: don’t rely on it. It won’t alert children who have a hearing loss (or other disabilities). Forgot to add (need morning coffee…) – excellent little piece. So, did anyone submit this to the Auckland Unitary Plan? I saw it too late. 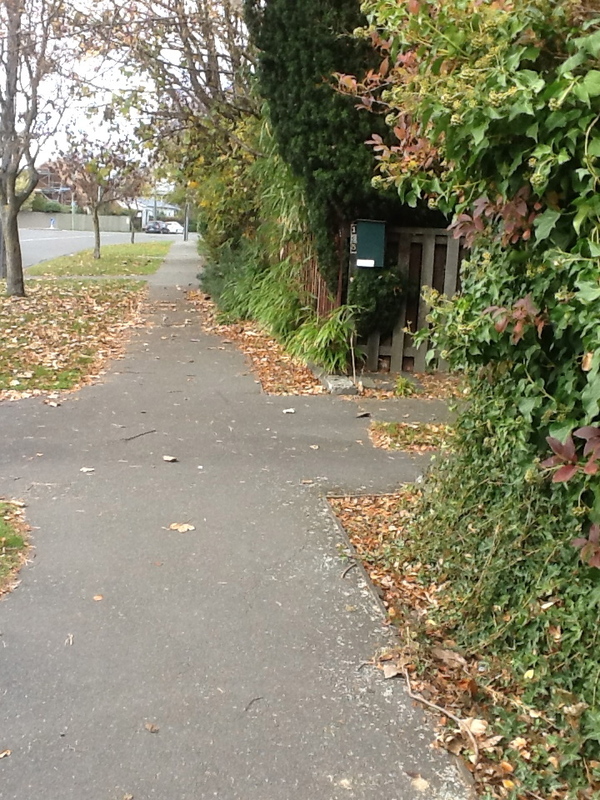 That’s the place to address driveway design though: Council planning rules.